Mexico is the largest world production center of talavera tiles with patterns. Most facilities are located and Dolores Hidalgo and Puebla while Dolores has the largest output. Mexican Tiles with patterns are handmade of three different clays from state of Guanjuato and San Luis Potosi. Once the clay is mixed and dry enough it is hand cut in form of the tiles. It has kind of red terra cotta color. Then the clay tiles are covered with the background color. Afterworlds, the tiles are hand painted with Mexican patterns in classic colonial, folk art and other traditional designs. It takes Mexican tiles eight hours fired in about 850C to create the glaze. Mexican tile surface is not covered with any additional material, it is the paint itself having shiny crust due to baking process in high temperature. Mexican tiles are not entirely flat and as soon as installed on kitchen bathroom wall, counter or backsplash they develop small cracks in the "glaze" making the patterns antique looking. To speed up the crazing process you can place them in the water for a while and then dry on the sun. If you want to make the crackles more visible use darker grout. To diminish it apply cement with the tile predominant color. It will hide cracks to some degree. If you are looking for ceramic tiles without the rustic look, ceramics from Mexico are for you. 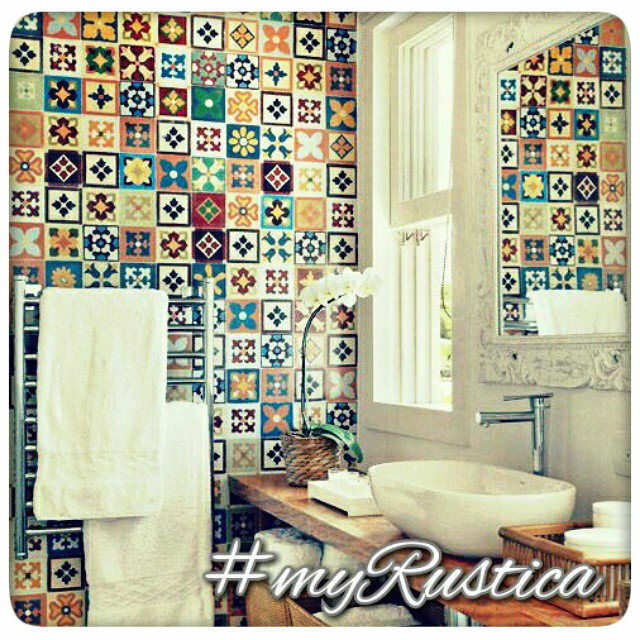 Look instead for other type of discounted tiles Rustica House has on offer.